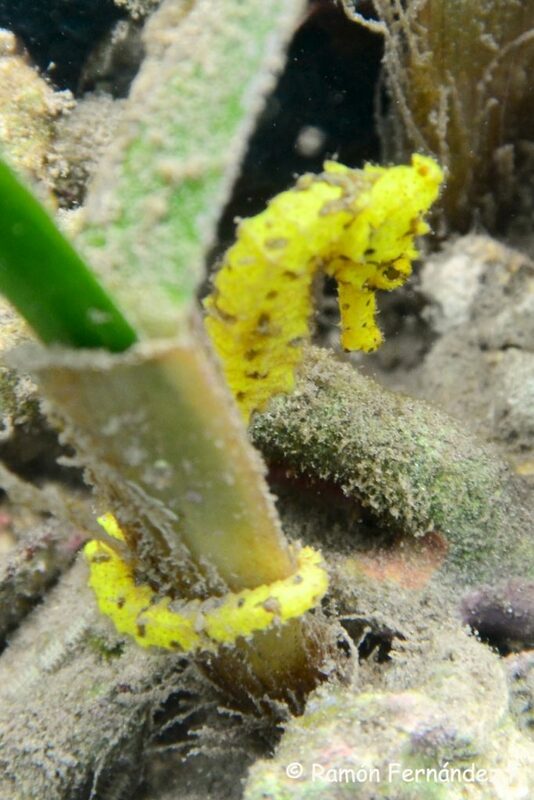 One of the most intriguing, secretive and unknown species of the Bocatoranian marine wildlife is also one that occupies a privileged place in everyone’s personal wildlife universe: Seahorses. The Longsnout Seahorse, Hippocampus reidi is the species found in Bocas del Toro. Many of us have enjoyed seahorse cartoon characters, bathroom stickers, pictures, and documentaries. We have seen them in aquariums or dried out in local market as souvenirs. In some cultures they use them as a traditional medicine. For many years I believed that they were just a Bocatoranian myth, but local neighbors remember the times where they were often seen under their docks or attached to sponges on the dock posts. I have never seen them on Isla Colon, yet I was lucky enough to find one some time ago. What makes it more incredible is that the one I found is within swimming distance of Tranquilo Bay’s dock. In the very same area in which I found it, I continue to see it from time to time. One important thing that I have learned is that the times I have seen it are when I am choosing to have a very slow mode snorkeling experience. Because seahorses are not good swimmers they have an amazing camouflage system in the bony plates covering their bodies. This is their only defense against predators. There are many interesting facts about seahorses; I am just going to give you some of them that I believe curious enough to be shared. Their unusual reproductive strategy is one of them, the males are the ones that will carry the eggs after the female lays them in a special abdominal pouch on the male (where they are fertilized). He will incubate them and 14 days later he will give birth by opening the pouch to the tiny (0.2 inches) young seahorses that are identical yet smaller than the adults. They are generally believed to mate for life, but what scientist have confirmed through the data collected is that some seahorses do have monogamous relationships in which they stay together for several mating seasons in a row. Seahorses are considered an important species in the aquarium trade. They are one of the most exported marine ornamental fish species in Brazil. With all that interest and curiosity that seahorses awaken in the human mind, many sea horse populations are on the decline given that they have been collected as aquarium fishes, used in folk medicine, and sold as souvenirs. Another important threat is that they are included in the by-catch of shrimp boats in the USA, Mexican and Central American ocean waters. 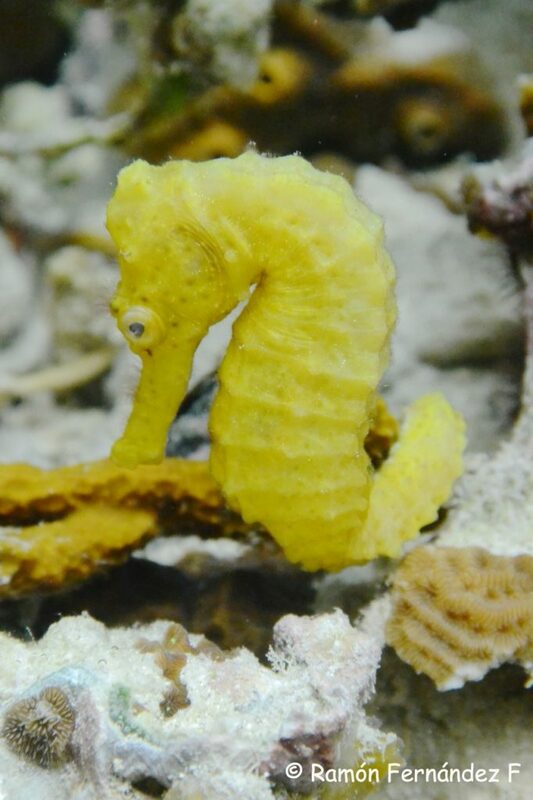 Even with all this pressure on seahorse populations, according to the International Union for Conservation of Nature (IUCN) the species are considered “data deficient” so they are not included in the IUCN red list of endangered species. The Convention on the International Trade in Endangered Species of wild fauna and flora (C.I.T.E.S) includes our Longsnout Seahorse in their list as “Threatened”, in the Apendix II CITES 2004. This is a good example of how important it is that scientists continue to study the Longsnout Seahorse in order todeterminewhether or not its population is stable and what conservation measures might need to be initiated. If we do not even know if there is a problem … how are we going to fix it? 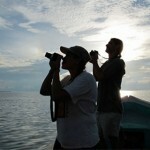 This entry was posted in Bocas del Toro Panama, Snorkeling, Wildlife and tagged Longsnout Seahorse by Ramon. Bookmark the permalink.